“…Many … orthopaedic surgeons … may also sustain on-the-job injuries, according to a study recently published in The Journal of Bone & Joint Surgery. 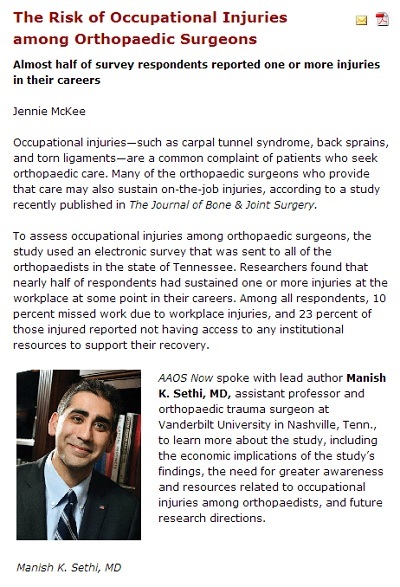 To assess occupational injuries among orthopaedic surgeons, the study used an electronic survey that was sent to all of the orthopaedists in the state of Tennessee. Researchers found that nearly half of respondents had sustained one or more injuries at the workplace at some point in their careers. Among all respondents, 10 percent missed work due to workplace injuries, and 23 percent of those injured reported not having access to any institutional resources to support their recovery. As a medical practitioner, you need to secure income protection for doctors to be prepared if ever happens to you. Since majority of your income comes from professional fees, you should receive proper compensation from missed income opportunities that stem from occupational injuries. In these types of cases, it is advisable to seek the services of a financial services provider that specialises in the medical field, such as MEDIQ. Medical financial service providers allow you to create a contingency plan in the unfortunate event that disallows you from providing for your family. Entrusting your income protection claims to financial advisers with services that are dedicated to medical professionals is different from typical workers’ compensation claims. Because they have a deep understanding of your line of work, they can represent you better so you can receive rightful compensation for your financial protection. More importantly, you can take advantage of their services in your other financial endeavours. Whether it be your investment portfolio, personal expenses, or particular tax deductions for doctors, their specialisation in the medical field allows for customized services that suit your income stream. In turn, you will not have to deal with unexpected financial setbacks, knowing that somebody is working to strengthen your financial capabilities.